A dominant display from Collingwood midfielder Taylor Adams. His output for the match so far has included an equal seasonhigh 28 disposals at 57 per cent efficiency, 16 contested possessions, eight clearances and four marks. Jarrod Harbrow has taken a match best five intercept marks for Gold Coast. The next most of any man on the ground is three from Collingwood's Chris Mayne. The Magpies have not kicked a goal since the tenth minute of the third quarter. Gold Coast has dominated the second half inside 50 count, 28 to 16. However, Collingwood's better ability to convert their entries into scores (38 per cent to 29) has seen Gold Coast make very little progress in reducing the scoreboard deficit. Collingwood's Matthew Scharenberg does the little things to help his team. His ten one percenters is the game high for either side. Michael Rischitelli has averaged 17 disposals per game against Collingwood across his career, his thirdlowest average against any side. With just seven disposals so far tonight, the former Brisbane Lion is having another quiet night against the Magpies. Gold Coast closed the third quarter with the last six inside 50s, but could only kick 0.3 during this period of dominance. Suns InterchangeSean Lemmens off due to an injury. 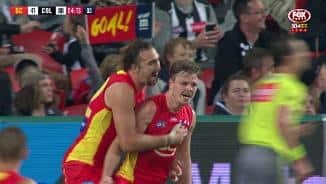 In the last ten minutes Gold Coast has scored 3.0 to 0.2 while kicking the ball with 85 per cent efficiency compared to 60 per cent for Collingwood. Magpies InterchangeLynden Dunn and is possibly out for the game. Gold Coast's Josh Schoenfeld kicks his first goal for the season in his third game for 2018. 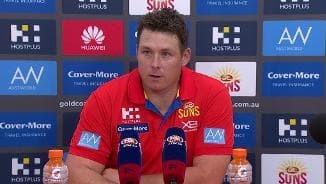 The Suns have scored from just 38 per cent of their inside 50 entries this season, last in the AFL. They are unlikely to improve on this ranking tonight, where their scores from inside 50 conversion is only 22 per cent for the game. The Suns have laid just a solitary tackle in the first twelve minutes of the third quarter. Not surprisingly, the three leaders in terms of metres gained are all Magpies, debutant Brayden Sier with 357, Jack Crisp with 319, and Scott Pendlebury with 311. Gold Coast has won five of the last seven clearances, yet 11 of the last 14 inside 50s have been to Collingwood. After losing both the disposal and contested possession counts in the first quarter, the Magpies asserted their dominance in the second. They won the disposal count for the term 94 to 82, as well as the contested ball 45 to 35. 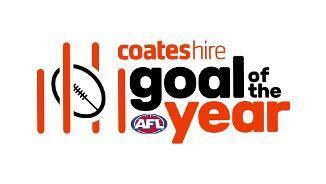 Gold Coast has had just three kicks (all ineffective) in it's forward 50 for the entire second quarter. Four of the Magpies' five second quarter goals have been the result of a disposal chain that began with a Gold Coast turnover. In terms of hitouts, Collingwood's Brodie Grundy is well in front of his Gold Coast counterparts with 22. However, he has only directed five of these to a teammate. Gold Coast's Jarrod Witts has fewer hitouts (14) but six have been to advantage. The Magpies have produced seven of the first nine inside 50s of the second term, including three to Steele Sidebottom. Of the six free kicks that Gold Coast has conceded, three have been for a push in the back. The Magpies have won the disposal count by 37 per game this season, best in the AFL. Tonight they are not having it all their own way, where the Suns actually lead the disposal count at present, 106 to 95. Five first quarter clearances for Gold Coast's Jarryd Lyons almost matches his pergame average of 6.5 across his first 11 games. Lyons also has 12 first term disposals at 58 per cent efficiency along with eight contested possessions. The Suns Touk Miller leads the disposal count with eight, but has zero in the last ten minutes. First year Magpie Brody Mihocek has kicked at least one goal in each of his four career games. After Gold Coast started the game with the opening five inside 50s, the Magpies have hit back with five of the next six. Suns debutant Wil Powell kicks a goal with his first disposal in AFL football. Gold Coast has controlled the opening six minutes, with five inside 50s to nil. They are also kicking the ball with 64 per cent efficiency compared to the Magpies 40. Opening goal scorer Jack Martin has his 13th major for the season in his 13th game. Collingwood's Jeremy Howe has won 84 defensive half intercepts this season, fourth best in the competition. Gold Coast has taken only 12 marks from its offensive oneon-one contests this season, the fewest recorded by any side in the AFL. Welcome to Metricon Stadium for the Gold Coast Suns v Collingwood Round 15 clash. COLLINGWOOD has surged into second place with its sixth straight win, easing past Gold Coast by 39 points at Metricon Stadium on Saturday night. 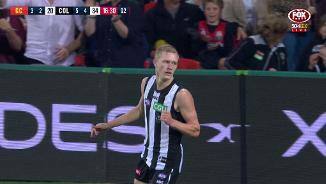 The Magpies kicked eight consecutive goals across the first and second quarters to set up a match-winning lead and were never seriously threatened. They led by 38 points at the main break and extended that to 59 points during the third quarter before winning 14.15 (99) to 8.12 (60). The win was soured by a knee injury to defender Lynden Dunn during the third term that kept him from returning to the field. 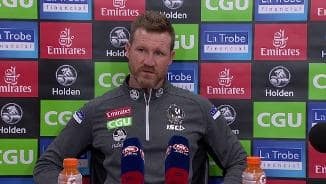 Magpies coach Nathan Buckley was frustrated his team didn't go on with the job as Gold Coast won just its second final quarter of the season. "I thought we played as good a footy in the first two-and-a-half quarters as we've played," Buckley said. "I really thought it was a challenging contest. "Then we dropped right off. It looked like physically we weren't able to maintain it. "It was an ugly game of footy for the last 45 minutes. "We played some of our best footy and we played some of our worst." However, they now trail only Richmond after 15 rounds, edging past West Coast, Sydney and Port Adelaide on percentage to sit in second. While the loss of Adam Treloar to injury might have an impact down the track, it made little difference first-up, with the midfield load shared around. Skipper Scott Pendlebury (25 disposals and a goal) and ruckman Brodie Grundy (23 touches, 49 hit-outs and nine tackles) could raffle the best on ground. Taylor Adams (30 and eight clearances) was exceptional in tight, while Steele Sidebottom (24) and Jack Crisp (22) also got plenty of ball. Josh Thomas also had a night to remember against the club he first played TAC Cup for in its inaugural 2009 season. The 26-year-old Queenslander continued his fine season, kicking four goals to go with 22 disposals, including a special effort midway through the second term. 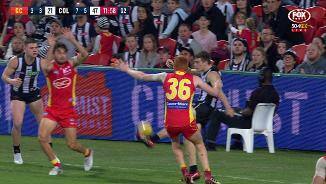 He ran down unsuspecting Suns defender Jarrod Harbrow, crunched him in a tackle and then picked up the loose ball before it could go over the boundary line and calmly slotted the snap with his left boot from deep in the right forward pocket. 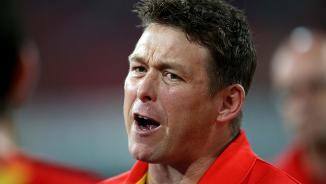 While it's the first time Collingwood has won six straight since 2012, the loss was Gold Coast's ninth in succession – the third worst streak in club history. The Magpies' pressure was just too much. The Suns tried hard early, and debutant Wil Powell kicked a sublime goal off the left foot with his first kick in the AFL, but they couldn't sustain the intensity for long enough. 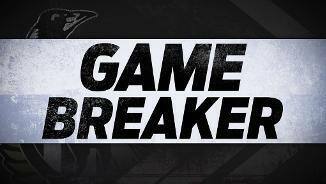 Collingwood pounced on turnovers, with cross-goal kicks from Steven May and Jarrod Harbrow in their defensive 50 picked off in the first half for goals. It was a theme that haunted Stuart Dew's men. To the Suns' credit though, they continued to fight where they haven't in previous weeks, and understandably Dew was rapt. "That last 40 minutes ... the heart that they showed and I guess the passion for each other was really there," he said. 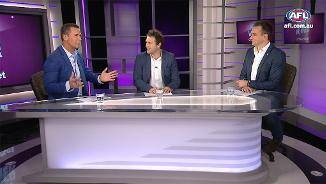 "It’s a turning point for the footy club, I think the way they went about it. 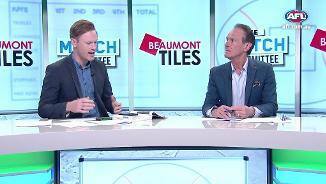 "After they kicked the first three goals in the third quarter, the response was impressive. "Full credit so the players on that one. I think there was a lot to like for our footy club and supporters." Gold Coast had more inside 50s (58-52) but were sloppy. Touk Miller (33), Jarryd Lyons (32 and 12 clearances), David Swallow (31) and Jarrod Harbrow (29) all busted their backsides for four quarters. Gold Coast: No problems for the Suns, with co-captain Steven May getting through his first match back in a month after suffering an ankle injury. Collingwood: Defender Lynden Dunn was the only casualty from the contest, limping off with a knee injury in the third quarter. 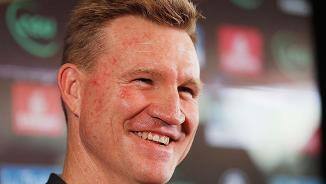 Coach Nathan Buckley said Dunn would need scans, but he was "concerned" about the injury. 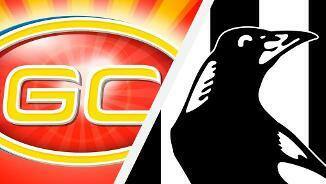 The Magpies will try and make it seven wins in succession next Sunday when they face arch-rivals Essendon at the MCG. Gold Coast will try and snap its losing streak on the same afternoon when it faces North Melbourne at Etihad Stadium – a team it beat in the opening round.